Significant Others is an installation that draws in equal measure from the gender-neutral term for one’s partner and from Donna Haraway’s 2003 publication The Companion Species Manifesto: Dogs, people and significant Otherness. While the term ‘significant other’ smacks of overt political correctness, it is interesting in that it acknowledges not only that the gender of a person’s partner need not be specified, but also that a person’s primary intimate relationship may not be sexual in nature. It allows space for intimacy that is separate from sexuality and the strongly enforced normal of ‘romantic love’. Sorensen approaches the humans, animals and plants with whom she cohabits with compassion and alertness to difference, striving to locate the singularity of each relationship. 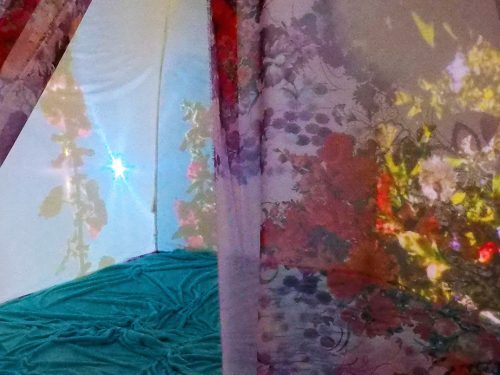 These moments of relationship are brought together in an experiential installation that allows us to glimpse the small intimacies that arise through the mundane daily acts of caring. The installation asks its audience to engage their bodies as well as their eyes. The open door of the tent invites the viewer to enter its intimate interior and spend a moment in contemplative imagination. The artists hope is that, in this contemplative space it is possible that the human might meet these significant others, just for a moment, as individuals rather than as generic members of another species.